Epoxy putty for repairing concrete metal, wood, fiberglass etc. Bonds new concrete to old. Thick white putty used on dry to damp surfaces and underwater. Will cure to a hard, rock-like solid in the presence of dampness or even fully submerged under water. Excellent adhesion to concrete, aluminum, metal, wood, fiberglass, etc. 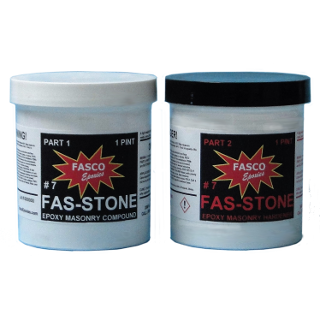 Has great tensile strength and is an excellent epoxy glue. Has great impact resistance and chemical resistance. Can be drilled or tapped. Will set or gel in 3 hours. Rock hardness in 8-10 hours. Can be mixed with sand as much as 1:1, making an epoxy cement and cutting the cost in half. Can be troweled on as a floor-topping compound producing a floor surface of great durability and chemical resistance. When mixed with sand 1:1, coverage per gallon of the mixed material at 1/8" thickness is approximately 18 square feet. Low cost epoxy glue of great strength. Industrial floor topping for greater wear and chemical resistance. Underwater sealing and patching compound. Concrete walk, driveway, or floor patching compound. Will glue old concrete to new concrete. Many other applications where great gluing strength, fast set time, chemical resistance and impact resistance are needed. Mix equal parts of Part 1 and part 2 very thoroughly. As a concrete patching material, as much sand may be added as desired to reduce cost and increase viscosity. In general, mixes in excess of 1:1 will be too dry and not have proper adhesion. Surface to be repaired or glued should be as clean as possible and free of grease, wax or oil. Apply patching compound in any thickness desired. When troweling as a floor topping or wall surface, water may be used to wet the trowel and smooth off the surface. After mixing Part 1 and Part 2, material must be used within 1 to 1-1/2 hours, depending on size of batch mixed. Larger batches will gel quicker. CAUTION: FUMES FROM PART 2 HARDENER ARE TOXIC. THIS MATERIAL SHOULD BE MIXED AND APPLIED WITH ADEQUATE VENTILATION. CONTACT WITH SKIN SHOULD BE AVOIDED AND RUBBER GLOVES SHOULD BE WORN TO AVOID ANY POSSIBLE SKIN IRRITATION. Determined on 1/8" thick test specimens at 25°C. Cured for 16 hours at 25° C. followed by 2 hours at 100°C. Percent weight loss after 24 hours at 150° C.
Percent weight gained after 24 hours immersion in water at 25° C. "